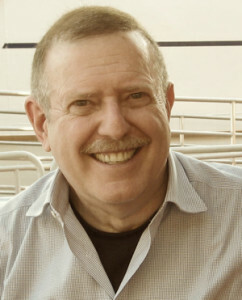 Michael S. Greenly is an American writer, entrepreneur, and lyricist who helped to popularize interactive online journalism in the mid-1980s as a kind of forerunner to blogging. In 1983, Greenly left his position as a marketing vice president of Avon Products to become a freelance marketing consultant and writer. In an article for The Futurist magazine (March-April, 1987), Greenly credited the Alvin Toffler book, The Third Wave, as being a catalyst in his decision to change his life and become an active part of the Information Age. Greenly has been called “probably the most widely read writer on The Source“, one of the first online services oriented to the general public and attracting 60,000 subscribers at the time. 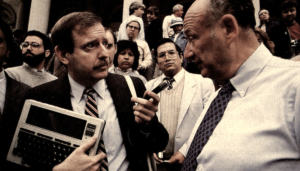 Sometimes called “planet earth’s first interactive journalist“, Greenly and the two friends he met online – Sherwin Levinson and Diane Worthington – became the first journalists ever allowed to cover the Democratic and Republican political conventions via computer (in 1984). Greenly wrote a cover story for Portable 100/200 Magazine (April, 1985) about using an early laptop computer to create this interactive, online journalism from the convention sites (Houston and San Francisco) and to answer reader questions and comments during the process. Greenly went on to become the first journalist ever allowed to cover the Academy Awards™ ceremonies by computer, again sending online reports of his interviews and experiences to readers around the world via laptop, and responding to them from on the road. 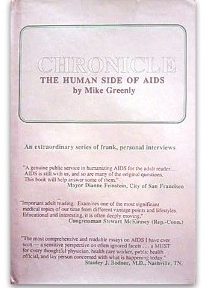 In 1986, a series of first-hand interviews Mike conducted about AIDS and placed online was published as Chronicle: The Human Side of AIDS (Irvington Publishers, Inc.). In 1987, Greenly received an award from the Computer Press Association in the category of “Best On-Line Publication” for his interactive electronic coverage of Appleworld, Macworld Conference & Expo, and Comdex ’87. Today — after a successful corporate career, Mike helps clients around the world pursue their ambitions. He is widely acknowledged as one of the finest speech writers and presentation coaches in the business. He is also a creative director, marketing consultant, focus group moderator and video interviewer … with a passion for songwriting. He has hosted live events and corporate broadcasts. Mike is also a published lyricist. His song, “How Many Christmases“, written with composer Jim Papoulis and recorded by Rosanne Cash and the Young People’s Chorus of New York, is being marketed globally by Boosey & Hawkes, a British music publisher. By the spring of 2010, another of Greenly’s songs “Get Up”, had been released. It was written with Jim Papoulis, sung by Kimberly Davis, and published by D1 Music. “Get Up” was on BILLBOARD magazine’s chart of the Top Dance Club songs in America for at least 10 straight weeks, attaining the #12 position in the magazine’s print edition, dated April 24, 2010. Mike and Jim have also written “We Can Plant a Forest”, also available as online downloads or as sheet music. The pair are sharing royalties with Trees for the Future, a global non-profit which helps to reforest the planet. With another composer, Paul Guzzone, Mike is the lyricist of two songs published by D1 Music, Inc., on the debut EP of Shara Strand from D1 Music. The album is called, “Born Tonight”, and debuted in June, 2012. Mike’s two songs – “I Will Carry You” and “Not Gonna Miss You” (which Ms. Strand also co-wrote) are performed in two styles – Pop and Live Acoustic. 13 Sep 2015Show Us Your Shoes! 11 Sep 2015My Tuxedo is Ready ….